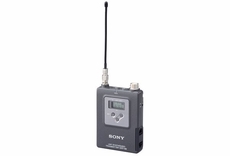 The WRT-8B Body-pack transmitter is the latest addition to the extensive range of Sony UHF synthesized wireless microphone systems. Extremely compact and lightweight, essential qualities for use in fast-moving TV and theater productions. Inside its tough, die-cast magnesium body is a highly stable, low noise transmitter providing superb audio quality. 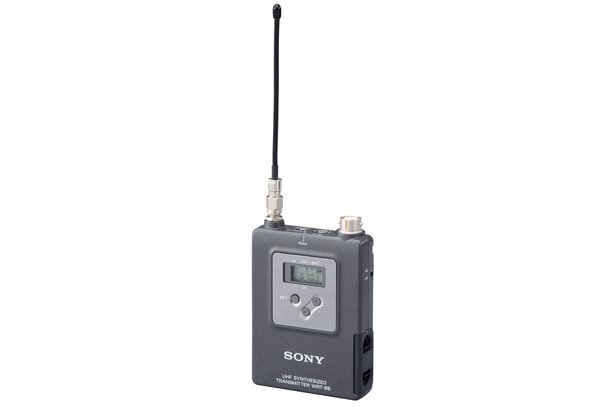 It can operate for up to 13 hours on two AA-batteries, and features switchable AF input (Mic/Line) and RF output levels (10mW/50mW). As well as theater and Studio use, the WRT-8B has the functionality and rugged construction that makes it ideal for the demanding environments of news gathering, documentary production and sports events. Battery Life: 6 hours @ 50 mW with Sony LR6 alkaline batteries. 13 hours @10 mW with Sony LR6 alkaline batteries.